NextThe Body and Mind Connection – Be Your Own Superhero! How often do you find yourself ‘losing’ an hour scrolling through the internet, looking at Facebook and other social media platforms? This is time when we are being ‘mind-less’, unfocused on being in the present moment and typically being unproductive. Whilst we could be forgiven for thinking that this time is relaxing, the truth is that we are being sucked into a void of other people’s lives and stimulated into reactionary behaviour. A walk with a friend recently brought this interesting topic to light as she felt that she was constantly “on call” to work, even on a Sunday, with emails coming in and the overwhelming feeling that she needed to respond to them because these people were expecting an answer there and then. We discussed this at length and I suggested that she re-evaluate her priorities and take a look at how she was handling her own reaction to these emails. She took this advice and decided to ignore the emails and pursue her own creative activities for the day and was relaxed and happy. Until….she picked up her phone and logged into Facebook, deciding to change her profile picture, and before she knew it she was sucked into the vortex of social media, immediately putting her back into a more tense frame of mind. The definition of relaxation is “the state of being free from tension or anxiety”. Whilst we may feel that flopping down in front of the TV at the end of the day is a great way to unwind and relax, it is actually bombarding our system with more stimulation as opposed to relaxation. Likewise, reaching for a glass of wine is also stimulating and may actually result in a worse night’s sleep. 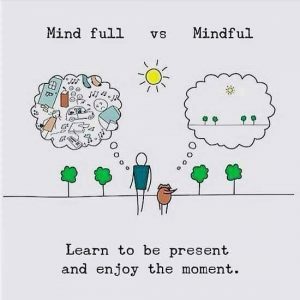 Mindfulness, whilst it can be implemented within relaxation techniques, it is not necessarily a relaxant in and of itself. It can actually evoke feelings of unease, racing thoughts, stimulating the senses and not relaxing us at all. When our bodies experience stress we release catecholamines, including adrenaline, noradrenaline and cortisol via our sympathetic nervous system. This is known as the “fight or flight’ response, providing the body with energy to respond to the perceived danger. Our digestive system shuts down allowing blood to flow to the muscles in the event that we need to run away or put up a fight. This primal reaction was designed to react to ACUTE stress – being chased by a predator for example. However, in our modern society we are now suffering from CHRONIC stress – stressful situations on a daily basis. Physical – too much of the wrong kinds of exercise or overtraining – or NO exercise! Chemical – using conventional cosmetics, household cleaning products, amalgam fillings, medications.. The list goes on. When these stresses are constant our bodies cannot get rid of the cortisol that has built up in the blood. The cortisol turns young fat cells into mature fat cells and increases your cravings for high carbohydrate foods. Cortisol can increase your metabolism but it also makes you hungry, so although you may be burning more calories when stressed, you may eat more to compensate. Cortisol is also considered a Catabolic Hormone – which means that it breaks down muscle tissue for energy – and losing lean muscle tissue will also result in a decrease in metabolism. Although we cannot avoid stress entirely, we can learn to build resilience against it, and to mitigate the negative health impact that it can have, by implementing relaxation techniques and being mindful of the amount of time we spend doing activities that may promote a stress response, such as constantly checking emails, making ourselves available to others 24/7 or even watching the news when we know that it only agitates us. To combat the stress response, we need to learn how to activate the relaxation response, a term coined by Dr Herbert Benson in 1975. Dr Benson is a medical doctor, professor, author and founder of the Mind/Body Medical Institute at the Massachusetts General Hospital. The relaxation response is the scientific term used for meditation and is triggered by the parasympathetic nervous system, inducing a state of deep physical and mental relaxation. 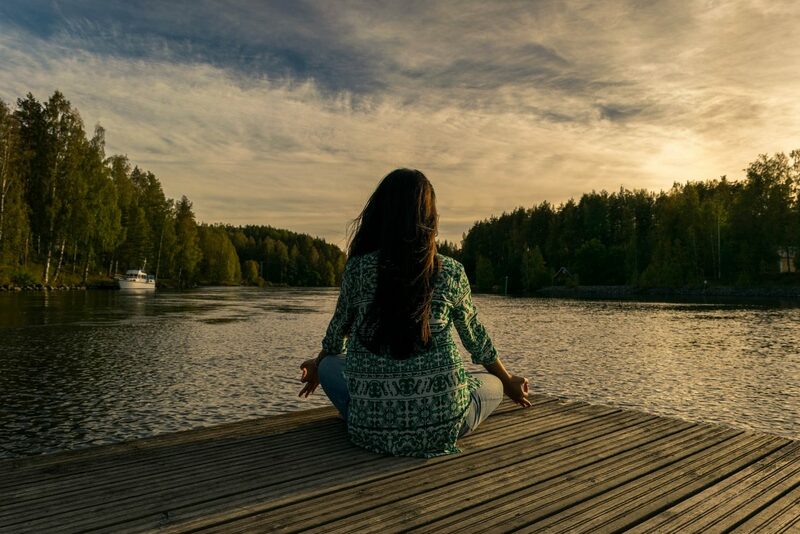 Regular implementation of relaxation and meditation techniques have been shown to reduce symptoms such as hypertension, gastro-intestinal disorders, fibromyalgia, anxiety and depression, which can be the result of chronic stress. Being in the state of ‘flow’ is when an individual is totally immersed in a project or activity, with their mind completely absorbed by what they are involved in. It typically induces feelings of energised focus, involvement and enjoyment. When you are in the state of flow you are oblivious to the outside world around you. This can be a useful technique to cultivate to help combat stress. The recent ‘adult colouring books’ are a great example of a tool we can use to get into the state of flow. 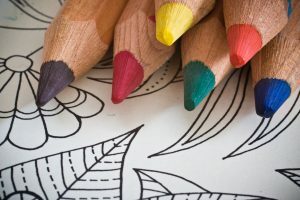 Who remembers enjoying colouring for hours when you were young? Why is it deemed an activity for children only? The introduction of colouring books for adults was an inspired ‘invention’ in my opinion! 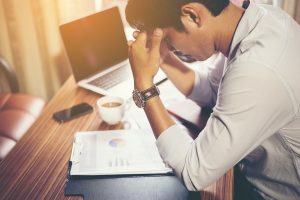 A helpful way to decide which techniques are best for you is to first identify the way that you react to a stressful situation. Fight – If you typically become angry or agitated when stressed then the best techniques will be those that calm you down such as muscle relaxation (body scans), meditation, deep breathing or guided visualisation, colouring, writing and other mindful activities that induce the state of flow. Flee – If your tendency is to want to ‘run away’ from a stressful situation by becoming depressed or withdrawn, the best techniques for you are ones that should encourage you to become stimulated in a positive way, such as rhythmic exercise (kettlebell swings are a fantastic rhythmic exercise), massage, yoga or mindfulness awareness. Freeze – If you become ‘stuck’ and don’t know which way to turn under stress, then choosing a physical activity to actually stimulate your fight or flight response could be the best option for you. Activities that use the limbs such as running or dancing, Tai Chi or power walking can be extremely helpful in this circumstance. Relaxation techniques, such as meditation, can take a while to learn so this means practising them on a daily basis. Committing to regular exercise can also help to mitigate the effects of stress on your body and mind. Being strict with yourself and allowing only certain times of the day to check and answer emails, read through posts or do the online shopping can not only free you from the constant pull of the connected world on us, but can free up a lot of precious time for more inspiring activities. If you feel that you are constantly dashing from pillar to post, never having enough hours in the day to put towards personal goals or relaxation, perhaps sitting down and taking a long hard look at where your time actually goes would be of benefit. If you really feel that there isn’t anything you could realistically drop, then perhaps your finances will stretch to allow you to outsource some of your responsibilities (such as hiring a cleaner once a week) enabling you to have more time to spend on the things you really want to do. Life is short, time is precious and our health even more so. Stress contributes to more sick days than anything else in the workplace. Putting a plan in practice for regular relaxation can help to reset your parasympathetic system and allow your body and mind to escape from the constant barrage of demands that life puts on you – even if it is just for a short while. To steal a tagline – “Every Little Helps”!